Fact-Checking Matt Damon's Promise About Clean Water In Stella Artois Super Bowl Ad : Goats and Soda It's a powerful claim: Buy a limited-edition Stella Artois beer glass and part of your money will help provide clean water for someone in the developing world for five years. Does it hold up? Editor's Note: This story was updated on February 5 to include information about the scope of the Stella Artois offer. In a new Super Bowl ad, Matt Damon makes a bold promise: Buy a limited-edition Stella Artois chalice and your money will help give a clean water supply to someone in the developing world for five years. The ad, called "Taps," reminds viewers that water is something we take for granted. Around the world, 844 million people do not even have a basic service providing water to their homes, according to the World Health Organization. "If just 1 percent of you watching this buys [a chalice], we can give clean water to 1 million people," says Damon in the ad. The 30-second spot was purchased by Stella Artois (estimated price tag: $5 million). It's part of an ongoing partnership between the beer giant and Damon's nonprofit group, Water.org, whose mission is to provide access to clean water and sanitation in the developing world. The chalices are sold on Amazon for $13, with $3.13 in proceeds from each purchase going to Damon's charity. The beer glasses are imprinted with designs by artists from India, Mexico and the Philippines, countries where Water.org currently works. Damon's statement about "1 percent of you watching" would add up to roughly 1 million purchases from the Super Bowl audience. According to Water.org, Stella Artois would donate the $3.13 for "up to 300,000 chalices" sold in the U.S. between January 1 and December 31. And what exactly does that $3 buy? Can it really bring clean water to one person for half a decade? Skepticism surfaced on Twitter. Why does my city water cost 30 bucks a month when the price of a beer mug will buy 5 yrs worth? This doesn't explain the correlation between the chalice and the water. Like how could buying one chalice fund all that? To me it just means Stella Artois won't help until we buy something. Even water specialists weren't clear on how the numbers were calculated. Despite its name, Water.org doesn't actually provide water to people in the developing world. So your $3 won't go directly toward, say, the delivery of jugs of water or the building of a well. To fulfill its mission, the nonprofit has set up a custom microlending system called WaterCredit. The group partners with financial institutions in developing countries to lend people small amounts of money so they can pay to get water. That might mean buying a faucet and hiring a contractor to tap into water supplies or buying containers to catch rainwater. 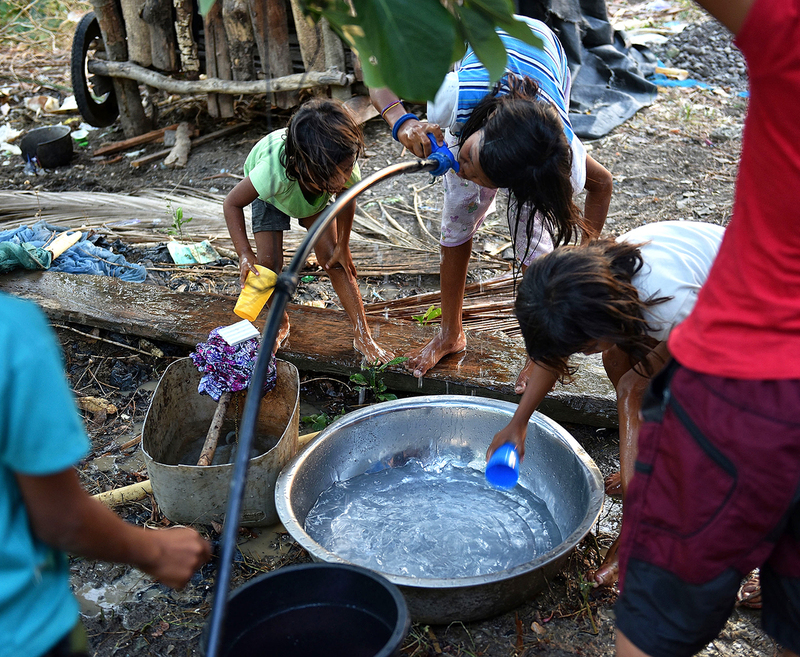 Children drinking from a makeshift water pipe in a village in the Mindanao island in the Philippines. Giving people that kind of choice is a good thing, says Annie Feighery, a co-founder of mWater, a digital platform that water nonprofits use to measure the impact of their work. The group has worked with Water.org for four years. For a long time, charities would try to fix a community's water problem by digging wells and then leaving, she says. But the wells would often malfunction and become contaminated within a year, and they cost a lot to maintain. Today, wells are seen as an "old-fashioned approach that we now call the dig-and-ditch model," she says. Although in some cases, wells are still a reasonable option. Families who live miles away from a clean drinking water source can take out a loan to pay for the construction of a deep borehole well, which siphons clean water deep in the ground, or a large container to catch and store rainwater. According to the World Health Organization, harvesting rainwater generally provides good quality water. Is $3 enough to cover those kinds of expenses? When someone buys the chalice from Stella Artois, $3 does indeed go to Water.org. And the answer is: $12.50 to give one person access to water. In this formula, the infrastructure for their water would last about 20 years. Based on these calculations, the $3 from the Stella Artois chalice, says Water.org, would provide five years of clean water. But that doesn't mean the loans are only $3. In fact, the average loan taken out by a borrower from local financial institutions, in partnership with Water.org, is about $300. According to Water.org, 99 percent of the borrowers pay it back. To date, the group says they have given out 2.2 million loans. When people repay the loan, the money gets lent out to others in the community, creating a multiplier effect, says Julie LaGuardia, a spokesperson for Water.org. "Sometimes in marketing efforts one needs to over-simplify to make reasonable promises to donors, retailers and investors," says John Oldfield, a principal at the Washington, D.C.-based advocacy group Global Water 2020. "But it's a good appropriate claim for the start of the conversation around clean water." Asked about the discrepancy between the $3 and the $300 figures, Melanie Mendrys, a spokesperson from Water.org, says, "I don't consider that a discrepancy. I know that the $3 does in fact help a woman or a family get access to the money needed to get water or a toilet." She does not think the ad is misleading. "It's an opportunity for people to learn more and once they do they get really excited," she says. "We just reached ten million people who received water or sanitation from our efforts. We know what we're doing is working and we're excited to reach more." And specialists do think the loan is a good approach. "What's novel about WaterCredit is that the loan is being provided for a home improvement," says Jenna Davis, an associate professor in the department of civil and environmental engineering and a senior fellow at the Woods Institute for the Environment at Stanford University. She has looked at the evidence around the Water.org's business model. A tap or some containers to catch rainwater doesn't sound like much, but it can have a significant impact for low-income families. "In many parts of the developing world, people were paying more for water in a month, for example, buying bottled water, than would be needed to pay a regular monthly bill if they had a piped connection," says Davis. Research has shown that for low-income households, the obstacle to installing the hardware or other connections is the cost, she says. Wouldn't it be more efficient if Stella Artois just gave a few million to Water.org instead of buying a Super Bowl ad? That was another question raised on Twitter: Why couldn't Stella just have forked over the money to Water.org? "It's important to remember that this is a Stella ad just as much, if not more, than a Water.org ad," says Jason Wojciechowski, creative director of Corelab, an agency that runs digital campaigns for nonprofits like Oxfam, Save the Children and Global Witness. Wojciechowski doubts that a Game Day ad alone would rake in a "ton of money" for the charity. The group would need to combine it with aggressive fundraising and social media campaign efforts over a long period of time. But he does think the ad will provide another service to the Super Bowl audience: planting the seed that change is possible. "Showing people that they have agency, responsibility and a role to play," he says. "The idea that there's something people can do to end the water crisis."